The Shangri-La Spa in Ashland, Oregon. Kate or Thom spotted this place Sunday, on our way up to Eugene. Kate and I stopped for lunch on our way south and happened to pass it again. As to the advertised servicies: I know what massage is. But ear candling? 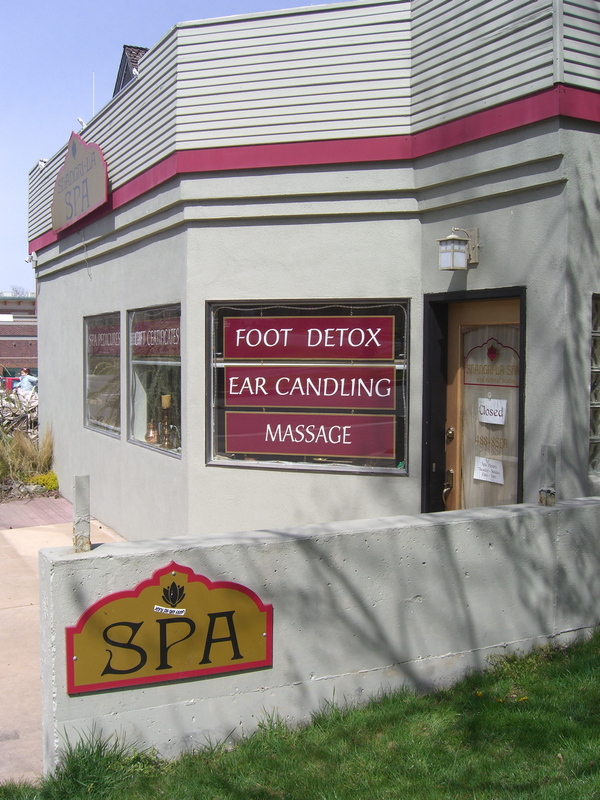 Foot detox? You have nothing to lose but your skepticism, and your cash. When the travel writer comes to your town, one thing’s inevitable: They’ll get it wrong; or wrong, at least, from the way you, the “native,” has come to see things. Every week, The New York Times does a little Friday travel feature called “36 Hours.” It purports to give you a quick but thorough tour of a city destination. This week was Berkeley’s turn. The writer starts out this way: “Anyone who thinks that Berkeley is just a hotbed of political radicalism is in for a surprise.” Oh, really? Let’s send this guy to Berlin: “Anyone who thinks the German capital is all about goose-stepping and burning books is in for a surprise.” Not that the radicalism cliche is so entirely out of date; we have our collection of ultra-shrills parading around downtown these days, apparently convinced that they can strike a decisive blow against the war machine if they can manage to get the Marine recruiting office to close. The second sentence reads as if the writer spent 36 minutes here, not 36 hours: “College Avenue, the town’s main drag, is packed with more hipsters with BlackBerrys than hippies with beards.” I love the juxtaposition of hipster/BlackBerry and hippie/beard. That’s a sensitive observer at work. But the problem is, if you asked 100 people all across Berkeley what the town’s “main drag” is–main drag is another colorful touch–I’d guess about eight of them might say College Avenue. Yes, it’s the main street of a popular commercial district in the city’s Elmwood neighborhood, but no way would it be considered the town’s main street (the other 92 of my 100 people would split, with most naming University Avenue or Shattuck Avenue and a handful might say Telegraph Avenue or Solano Avenue). All I can say is — not having ever encountered a crowded path during any walk I’ve ever done in the hills at any time of day, not having been aware of seeing a single student ever running off a hangover on the steep hills (don’t the really drunk ones sleep late, by the way? ), and not having witnessed a profusion of haciendas hereabouts — there are a few stunning Spanish colonial homes if you know where to look, but the notable local architecture is distinctly un-Mexican — I’d love to see the reporter’s notebook in which these details are recorded. If you’ve got 36 hours to spend in Berkeley, call a friend. Or me–I’ll be glad to show you around. I mentioned the other day my friend Pete, who’s training for both the Boston Marathon next month and for the an Ironman-distance triathlon in June, is visitiing down here from his new hometown of Portland (the one in Oregon). The other day we did a ride that’s become a favorite of mine, from Berkeley up to Davis; then we got on the train for the ride back. Today I went down to meet Pete at his folks’ house in southern San Jose. It is unknown territory for me in terms of cycling. I’ve ridden on Mount Hamilton a few times, and a few times in the Santa Cruz mountains, but San Jose has been mostly a big, incomprehensible sprawl (for non-Bay Areans: it’s the biggest city in the region, with about 1 million people; and unlike San Francisco, which is dense for a West Coast city, it is spread all over. 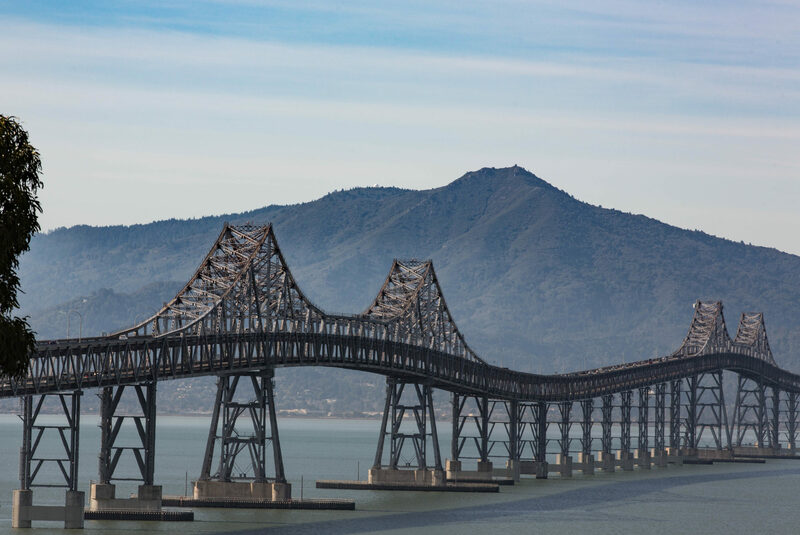 San Francisco’s population is about 750,000 with an area of about 50 square miles; San Jose has 1 million people in roughly 175 square miles (Chicago has 2.9 million in 227 square miles; New York 8 million in about 330 square miles. So yes, San Jose is spread out). I got a tiny bit of that San Jose tangle sorted out today. We headed south out of town, with a side trip (and climb) up to a county park; we noodled west and south through some low hills and then started up a road toward Uvas County Park that Pete had never ridden before. The road was narrow and ascended along a creek from open oak hills into redwood canyons–a transition that I think of as typical for the Santa Cruz Mountains. As the road narrowed, the creek gorge became deeper and the redwood stands taller and denser. After four or five miles we approached an archway that proclaimed we had reached Sveadal. In Swedish, Svea is sort of the personification of the motherland, something like Britannia or Columbia (though not rising to the level of Japan’s Amaterasu, who is a full-on goddess); in Norwegian, dal means valley, and I’ll bet it’s the same for the Swedes. Sveadal–which I’d call Svea’s Glen more than Svea’s Valley from the appearance of it–is owned by the Swedish-American Patriotic League of the San Francisco Bay Area, which has owned it for nearly a century. They have one big do their each year: a midsummer’s party. Lots of fun, you bet. It had been sort of a funny, cool, windy, mostly overcast day, but the sun came after we continued from Sveadal up to the entrance to the county park. We sat and talked for a while, then headed back. Pete said this was the kind of ride he really liked–it involved some real exploring, the kind you wouldn’t get to walking and the kind that would lose its flavor if you drove. “I don’t ever want riding to be just training,” he said. I agree, though at the same time I’m aware of all the countryside I’ve ridden through without really seeing it. We were about 25 miles from his parents’ house at this point, so we rode back down the hill, decided against any further southward exploration, and road through the headwinds home. 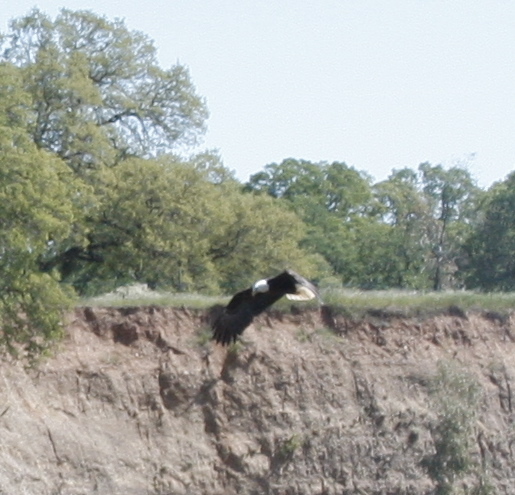 One added bonus: two golden eagles flew up from the side of Calero Reservoir just as I passed. I only paid attention because I spotted a guy with a camera watching them, and they’re easy to mistake for turkey vultures from a quick glance. But these were eagles, right by the side of the road. That’s it. Except to say this passage has always said something to me about the purely physical part of our identity, the part that engages on a level that we’re only dimly aware of, the part that finds joy in something like running or cycling or walking long walks. The cognitive linguistics course I’m taking this spring, one of the ideas it promotes is that the language we use–especially the metaphorical language we use, sometimes to describe complex and abstract thoughts, experiences, and objects–comes straight out of our physical experience on a very basic level–both what we see and feel in the world and how our brains process it. Those last three lines from Whitman seem to come from the same place: He recognized his identity not just as his mind and thoughts but as something arising from the fact of his physical being amidst all the beings and things in the world. And one last thing: Happy birthday, Ann! My friend Pete is down from Portland visiting his folks in San Jose. We had talked about taking a couple long rides while he’s here because this is a break week for me and he’s in training for an Ironman-length triathlon in June. The only problem: Between one thing and another, I haven’t been riding a whole lot for the last several months. So we didn’t wind up planning a ride until yesterday, when I suggested one of my favorite and not overly demanding longer rides: up to Davis from Berkeley, then back down here on the train. I had some trepidation because I haven’t spent more than a couple hours at a time in the saddle since late last year, and the riding I’ve done hasn’t been frequent. But we started out on the ride this morning, and even though I was sorer than I usually am from that ride, and I could tell I didn’t have much in my legs, it was a great ride. Beautiful day, too. It warmed up to about 70 while were on the road, and after having to battle some headwinds the first half of the ride, we enjoyed a pretty nice tailwind much of the second half. Back here after the train ride, we had dinner and talked for a couple hours. Then Pete drove back down to San Jose. The plan now is for more riding Thursday. Getting ready to shut down for the day, I took a look at the New York Times front page. There’s an absorbing story about Davis Phinney, the great American road racer of the 1980s and early ’90s, and his family. His wife is Connie Carpenter, one of the greatest U.S. women athletes ever. They have a 17-year-old son, Tyler, who has become a force in the world of track cycling and time trialing; the kid’s got a great shot at the Olympics. Meantime, Davis Phinney is suffering from Parkinson’s disease. Reading this piece reminded me once again how easy it is to take our health and abilities for granted, and how special it is to be able to climb on a bike and go. For years and years, we’ve had several old, unused computers haunting the place. Our first machines, PC clones from the late ’80s, are long gone. The oldest of the still-resident collection was our Macintosh Quadra, which had a manufacturer’s date of July 23, 1994, stamped on it. It came with a 250 MB hard drive and 8 MB of RAM, and it ran a new version of the Mac OS, System 7. It was an estimable desktop and, with memory and software upgrades and a 1 GB external hard drive, stayed in daily service through late 2000. By then other members of the family had gotten much newer Windows machines — because of the wider software choice, mainly. I eventually got a Dell laptop that weighed about 8 pounds and was faster and more modern than the Mac in about every other way and could take advantage of our new broadband Internet connection. So, just about the time Al Gore was winning the 2000 election, the Quadra was consigned to unplugged status. And there it sat, year after year. There was stuff on it that I was sure I’d get around to transferring onto some media or other and saving for posterity. Old email and document files full of my past brilliance. Tax returns. And lots of other material I’m sure I would have pored over and pondered for hours if not weeks. But with each passing year it seemed like a more and more complicated and less and less convenient operation to hook everything back up and deal with it. Eventually the Quadra got moved out to our weather-tight but temperature-uncontrolled shed. Every time I’d see it out there I’d think about those reams of incredibly clever things, whatever they were, sitting on the hard drive. Then I’d shut the door and lock it behind me. Today, for no other reason than it is spring break, Kate decided to clear out some of our accumulated junk. The old computers were in her way first and made their way into our dining room. The plan was to take them down to an electronics recycling place down by the freeway, but we were still concerned about any readable data on the hard drives. We weighed the merits of various ways to erase them. The recyclers wanted $30 per drive to wipe them using some powerful electromagnet. I suggested running over the computer cases with the drives in them. That idea was vetoed. 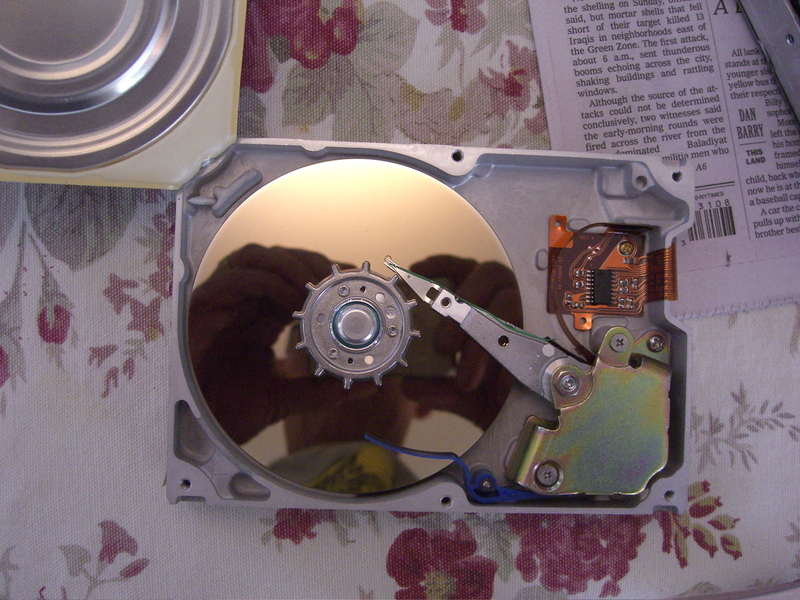 I suggested putting the drives in a big bucket and submerging them in water, but even as I said that I wasn’t sure that would ruin the drives since they’re pretty tightly shut. The method of destruction we finally hit upon was to remove the hard drives from the computers and open their cases. Simple exposure to regular Earth air in a non-clean-room environment would corrupt them. This method worked fine with the Quadra, because the manufacturer used Phillips screws to close the case (the other drives used those funny Torx-head screws). The pictures above (click on them for larger versions) show what we found when we got the box open. It was a little hard to remember that I was looking at mass-produced merchandise; the inner workings were unexpectedly plain and beautiful in a simple, straightforward way. Then the anthropomorphizing kicked in: those few bits of machinery were intermediaries in a lot of letters, stories and explorations. 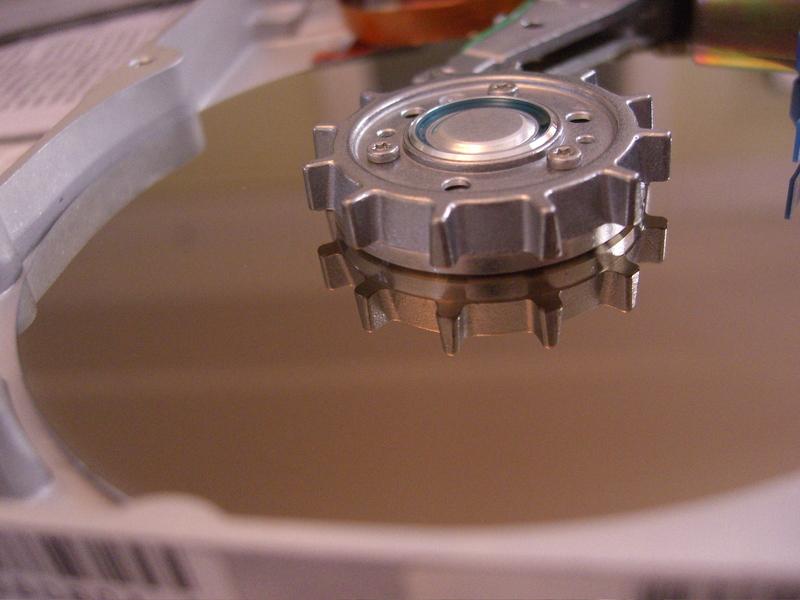 Exposing that disk, and thus killing it, made me feel a little bit like a vandal. But also relieved. I never would have retrieved anything from the Quadra, so I can cross that chore off my list. And I got off my little pang of destruction pretty quickly: I “compromised” the data on the other two hard drives we had here slamming them into a concrete patio floor a couple of times each. Then we took the whole mess down to the recyclers. As someone who has been approached several times over the years and asked if I was James Carville–yes, really; no, I don’t see the resemblance–I’ve always felt a certain kinship with him. I can be nasty and mean-spirited, too, just like him. And it’s always been nice to know that the Democrats have someone who can match the nastiest of the right wingers in any venom-spewing contest. But the act is tired. His issue is personal loyalty, and he’ll savage anyone who crosses his line. If Obama wins, it would be nice to think Carville would get flushed out of the Democratic Party for good. 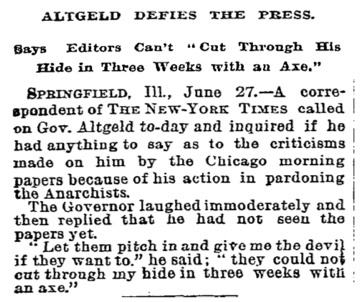 A few days ago, before this last blog mini-hiatus, I posted a 108-year-old item from The New York Times (“Forced to Drink Beer“). The story describes a couple of bar denizens as “laughing immoderately.” That phrase prompted Marie, a regular reader from Springfield, Illinois, to search for it in the Times archives and link to the search in a comment. I’m not sure what period she searched, but “laughed immoderately” appears 59 times. 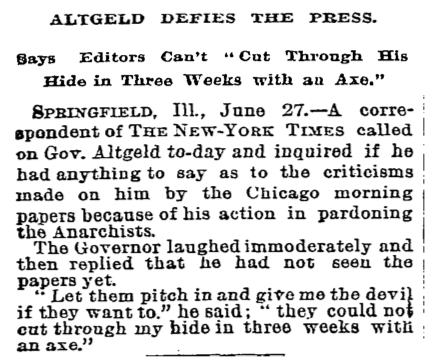 Looking through the list of those who expressed mirth or amusement in this rather unrestrained manner, I saw that one of those whose guffaws are memorialized forever in the Times archives is Governor John P. Altgeld (see the clip below). In responding on Marie’s comment, I mentioned the governor’s 1893 cameo in the search results. I referred to him as John P. “Eagle Forgotten” Altgeld, the second-greatest man who ever lived in Springfield (OK — your mileage may vary). “Eagle Forgotten” is the title of a biography of Altgeld first published (I think) in 1938. The book takes its title from a Vachel Lindsay poem about Altgeld, “The Eagle That Is Forgotten.” After reading my comment, Marie posted the poem. OK, now: Rob, a blogger near New Orleans who reads both Marie’s posts and mine, read the poem. He’s in the habit of citing a blog of the day, and after reading “The Eagle That Is Forgotten,” linked to a Vachel Lindsay site.